Apron, 28" x 36", bib style with neck loop and waist ties. Made with Tychem QC material. Yellow. Universal in size. 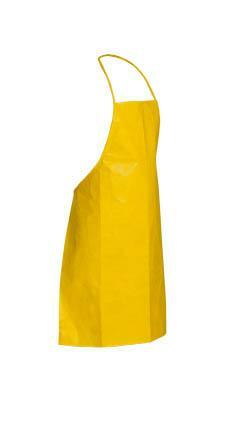 DuPont™ Tychem® QC Bib Apron. 28" x 36". Neck Loop & Waist Ties. Bound Seams. Yellow. The garment shall be constructed of DuPont™ Tychem® QC -- a DuPont™ Tyvek® protective fabric coated with 1.25 mils of polyethylene. The garment shall be yellow in color. Please read, understand and follow the Tychem® User Manual.